Though rooted in the past, classics is a constantly evolving discipline. If you want to deepen your knowledge of the languages, literatures, art, archaeology, religion, philosophy and history of ancient Greece and ancient Rome, consider our exciting master of arts program. You may choose to enhance your studies by doing fieldwork or research in Italy, Israel or Crete—and you'll find that we offer generous funding to do so. In addition to financial aid, we offer merit-based teaching assistantships to help defray the cost of graduate study while giving you hands-on experience as an educator. You'll be well prepared for a career in teaching in any number of disciplines, as well as for pursuit of a doctoral degree. In addition to studying our 800-piece Classical Studies Artifact Research Collection, which is housed on campus, you can visit the rich resources of nearby Boston and Cambridge, including the Museum of Fine Arts, the Isabella Stewart Gardner Museum, Harvard University museums and the Museum of Science. Many of our graduates become teachers in a variety of subjects such as art, English, history and Latin at the elementary, middle and high school levels. Many others go on to rewarding careers in museums, libraries and cultural heritage organizations. Still others go on to pursue a doctoral degree in classical studies, ancient history, comparative literature, ancient philosophy or a variety of other fields, including law or library science, in the finest programs in the country: Brown University, Brandeis University, Bryn Mawr College, University of British Columbia, Harvard University, University of California, Santa Barbara and Johns Hopkins University, to name a few. For the Ancient Greek and Roman Civilizations track, you'll focus more on classical art and archaeology, Greek and Roman history, classical literature in translation and classical mythology, and less on the languages and literatures of ancient Greek and Latin in the original. This track is either for professional development or in preparation for PhD programs in classical art and archaeology or ancient history. You must write a 20-30 page master's thesis. There is no language requirement for admission. For the Greek and Latin Languages and Literatures track, you'll focus on Greek and Latin philology, languages and literatures. This track is for you if you have already received substantial undergraduate training in ancient Greek and Latin. After completing this program, you'll be well situated for admission to rigorous PhD programs in classical studies across the U.S. and abroad. You must write a 25-50 page master's thesis or pass a comprehensive exam. In both tracks, CLAS 250B (a foundational course that delves into the methodologies, perspectives and theories of classical studies) is required, plus seven electives. We offer both merit- and need-based aid, as well as merit-based teaching assistantships to help defray tuition costs and provide teaching experience. Visit the Graduate School of Arts and Sciences website to learn more. For the fall semester (starts in late August): February 15. For the spring semester (starts in January): October 15. Contact Professor Joel P. Christensen and Professor Ann Olga Koloski-Ostrow for more information about the program. Having researched many master's programs Belisi decided that Brandeis "offered everything that I was hoping for." She met with the graduate directors before applying, which "made my decision so easy—they were wonderful!" Most importantly, she realized that the program would prepare her for further study in a doctoral program. 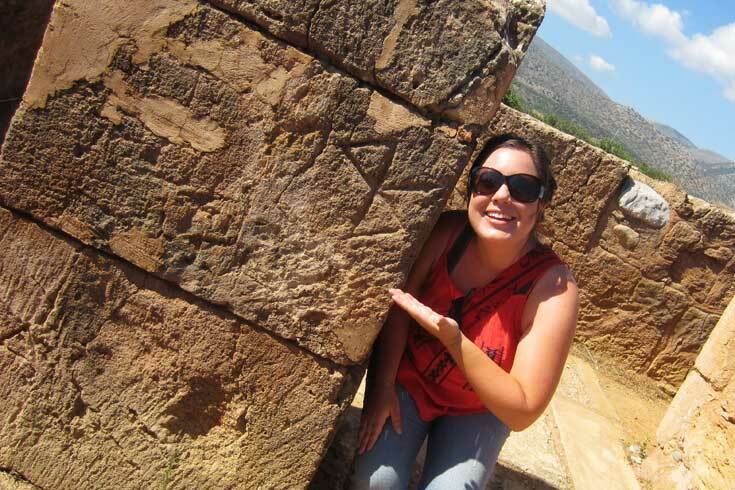 "I felt like the program could both fill in remaining gaps in my classical studies education while also edifying my progress as a student in the discipline," she says.